Development of a Miniature Xenon Ion (MiXI) thruster development that will enable precision spacecraft positioning and formation maneuvers for formation-flying spacecraft. The current MiXI thruster prototype will provide 0.5 – 3 mN thrust at 3000 sec specific impulse and efficiencies around 50% or better. 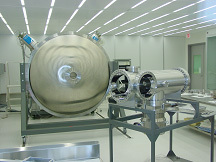 The MiXI thruster will use Xenon propellant, a noble gas, minimizing spacecraft contamination. Although other concepts are being explored, positioning control of spacecraft typically requires thrusters to move them about. For the very fine positioning requirements to be encountered for future formation flying missions, this requires very precisely controllable, low thrust values, even for relatively sizable spacecraft in the 500-kg wet mass range or above. Several thrusters are being studied for formation flying and constellation missions. In the past, so called colloid or field emission electric propulsion devices have been considered. However, current designs of these devices deliver thrust levels of only sub-milli-Newton levels, although very precisely controlled. Cold gas thrusters have also been considered. However, here a gas is simply vented to space through a valve at very low exhaust velocities, or specific impulses. A low specific impulse means that one requires a lot of propellant to accomplish the spacecraft maneuver. A new concept being explored for formation flying applications is MiXI. Actually, the basic concept of this thruster is not new. Ion thrusters have been developed since the 1960s, and have flown in space for the first time in the early 1970s. In an ion thruster, a plasma is generated. This plasma is basically a very hot gas in which electric charges are separated into positive ions and negative electrons. Although very hot, the plasma in an ion thruster is not very dense, having a pressure about a ten millionth of atmospheric, and thus does not pose a severe thermal problem. The plasma is generated by injecting a neutral gas into a so-called discharge chamber, then bombarding this gas with electrons ejected from a cathode. The electrons collide with the gas atoms, and “ionize” them, i.e. split electrons off its outer shells, leaving positively charges ions and negatively charged electrons. The ions are then extracted from the discharge chamber via a set of electrostatic grids and accelerated in an electrostatic field to very high velocities of approx. 40,000 m/s. To maintain charge neutrality, i.e. avoiding the spacecraft charging itself negative after emitting the positive ions, a neutralizer – a device very similar to the cathode - emits electrons back into the ion beam. After a long hiatus, ion thrusters have found a market niche in North-South stationkeeping maneuvers for Earth-orbiting satellites beginning in the 1990s – i.e. preventing spacecraft orbit drifts due to gravity actions of the sun and moon. Most notably, in the NASA New Millennium DS1 mission launched in 1998, a 30-cm dia. ion thruster was used as the main propulsion device to fly a spacecraft past the comet “Borrelly”. State of the art ion thruster technology, such as the DS1 thruster, is relatively large, and scaled for main propulsion applications, i.e. the need to move a spacecraft through space at high speeds. For formation flying applications, however, ion thrusters would be used in a unique attitude control mode, accurately maintaining the relative position of several spacecraft, or the rate at which they are moving with respect to each other. This will require multiple thrusters per spacecraft facing in different directions to allow 3-axis positioning control in space. Also, the required thrust levels will only be on the order of a few milli-Newtons, as opposed to the 90-mN thrust levels of the DS1 thruster. Hence, a miniaturized ion thruster is required. 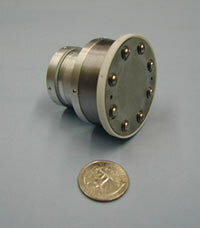 The MiXI thruster being developed at JPL is only 3-cm in diameter – one tenth the diameter of the DS1 thruster. It will require less than 100 W of power, provide a precisely controllable thrust (in its current configuration) of 0.5 – 3 mN and a specific impulse of over 3000 sec. As noted above, this high specific impulse will allow for the conservation of propellant, enabling this mission to either last longer, or the spacecraft to be lighter. The propellant used is xenon – a noble gas. It is very non-reactive, and thus poses no significant contamination risks. Propellant contamination is of major concern to future formation flying/interferometer spacecraft due to sensitive optical lenses on board the spacecraft. A laboratory version of the MiXI thruster has already been successfully operated at JPL at thrust levels up to 1.5 mN, specific impulses of 3100 sec and a thruster efficiency of 56% (excluding the cathode and neutralizer). This represents a major advance in the long history of ion thruster development, since small thrusters due to a higher surface-to-volume ratio have a greater tendency to loose ions to the thruster walls in recombination reactions, decreasing thruster efficiency. Currently, an optimized thruster configuration is in fabrication, and will be ready for extensive performance, plume and contamination tests shortly. Several areas of technology development still exist, most importantly low power cathode technologies, magnetic field and ion accelerator grid optimization, all with the MiXI thruster scale in mind. Plume (propellant exhaust) studies will also be conducted in a new JPL laboratory called “MPL” (Microthrust Propulsion Laboratory). Here we will determine if plasma exhaust could pose a danger to a spacecraft through “plume impingement”, and what design steps would have to be taken to avoid it.